With a few modifications, the popular smith & wesson m&p45 is perfect for small hands. Smith & Wesson's Military & Police pistols have taken the market by storm for good reasons. Among other things they offer superior ergonomics, high capacity and are extremely reliable. Interchangeable backstraps make the M&P series an ideal choice for military and police agencies that need to accommodate personnel of all hand sizes. The M&P line has gained tremendous popularity with private citizens also--for carry, sport and just plain fun--for the same reasons. For small-handed people like myself, the adoration comes down to size or, better stated, the M&P's lack of it. Unlike some other pistols with interchangeable backstraps, the M&P9 and M&P40 pistols actually are small with the small backstrap attached. For its capacity, the trigger reach with the small backstrap installed is the shortest that I have seen on any pistol. 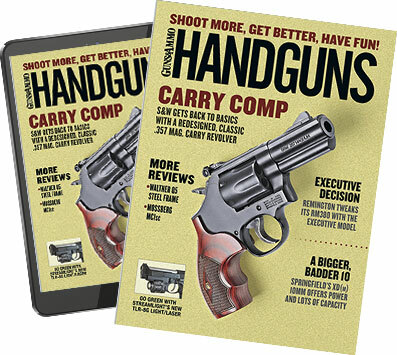 Seventeen rounds of 9mm or 15 rounds of .40 S&W packed into such a compact package is terrific for users with limited trigger reach. And of course, there are the medium and large backstraps for those with full-size mitts. Another design element that sets the S&W M&P series apart from other polymer, striker-fired pistols is that rather than riding on independent frame rails, the M&P slide cycles on four interconnected steel rails. This system provides extra strength for long-term reliability and reduces torque and frame flexing, which enhances shooter control.My first opportunity to handle and shoot the M&P40 was about 10 months or so before it hit the streets. I was at a training seminar held at the Smith & Wesson Shooting Sports Center, and the S&W staff allowed me to test-fire a .40 S&W preproduction prototype. I was struck by its comfortable ergonomics and especially by the short trigger reach. Being a lover of large calibers, one of the first questions to cross my mind was how the M&P would feel in .45 ACP. My question was answered not long afterwards at the 2007 SHOT Show. Joe Bergeron, S&W's product manager for the M&P line, gave me a run-down on the available options, which included a new frame-mounted external safety, color schemes and of course interchangeable backstraps. I think Joe noticed the enthusiasm drain from my face as I gripped and pointed the .45 downrange toward the target. I could hear concern in his voice when he asked me what I thought. I replied that the grip was bigger than I had expected, considering how comfortable I found the .40 version to be. He asked for the gun back and removed the grip panel. Returning the gun to me, he explained that the gun can be shot with the grip panel removed, which reduces grip size and shortens trigger reach. I immediately realized that the same type of epoxy commonly used to reshape the grip of Glock pistols could be used to fill in and shape the M&P's grip sans the grip panel. Smith & Wesson added an external safety option for the .45 version. It is similar in design and location to that of a traditional 1911. S&W plans to eventually offer a refit kit enabling the safety to be added and/or removed from all M&P models. Having been a 1911 shooter for many years, I found the external safety to be well-placed and easily manipulated. Unlike a 1911, the M&P safety does not lock the slide. As for colors, two choices are available: an all-black model with the external safety as an option and a model with a Dark Earth Brown frame available only with the safety. Both models feature a black melonite-finished stainless steel slide and barrel. Tritium night sights are also an option. Magazines currently shipping with the .45 have a capacity of 10 rounds. At the same show I got to meet Jim Ruiz from Predator Custom Shop (predatorcustomshop.com, 865-330-2423). Jim got his start as armorer for the Knoxville Tennessee police department where he was a firearm instructor and patrolman for seven years. His experience includes four years active duty in the military, during which time he served in Desert Storm, and six years in the reserves after that. After I handled his work and examining the proof targets, we discussed his shop's capabilities at length and agreed to work on a couple of projects together--one of which is the custom M&P featured in this article. My priority was to reduce the M&P45's grip. Jim did so by removing the interchangeable grip panel, replacing it with epoxy and forming it by hand into a comfortable and ergonomic shape. To offer a higher grip on the gun, Jim undercut the trigger guard a bit to allow a higher grip, enhancing recoil control. Epoxy was added to the frontstrap and along the underside of the reshaped trigger guard to provide a surface for texturing. About halfway through the curing process, Jim hand-stamped the epoxy all along the underside the trigger guard, on the front strap and on the newly formed backstrap to increase purchase on the grip. Besides the grip modification, I asked Jim to remove a portion of the beavertail. I like a robust beavertail but found that the M&P45's design extended a bit too far for me. With the frame reshaped and textured, the frame and slide--along with the exterior controls--were painted with Predator Custom's Rhino coating, which is a Ceracoat paint that is low-temperature baked, allowing it to be used on optics and polymer frames. All it takes is about two hours in an oven at 125 degrees to cure. For color, we decided on Flat Dark Earth, with a few parts left black for effect. I prefer to keep the triggers of my carry guns as close to factory stock as possible for reliability and liability reasons, so I requested that Jim smooth it out a bit but to leave the weight within factory spec. I was disappointed that the sights Smith & Wesson chose were of a smooth, sloped design, which does not allow for one-handed racking of the slide on a belt or other object. To rectify that issue and to add tritium for low-light shooting (my test gun came without the optional tritium sights), I turned to AmeriGlo (ameriglo.net, 770-390-0554) for its newly designed M&P night sights. Front sights are available in three heights to provide point of impact adjustment, and the factory height is available in two different widths. The tritium front sights glow green; the rear green or yellow. I chose yellow to provide contrast. I occasionally get jaded from handling so many guns in my line of work, but not so with this gun. The reworked M&P is visually stunning. The trigger, sights, slide endcap, barrel and guide rod retain the factory black color and contrast beautifully with the Flat Dark Earth of the frame and slide. Beauty aside, the purpose of the modifications was to make the gun fit my hand better, so picking up and gripping the gun was the first order of business. The shape was comfortable, and I was able to get a better reach on the trigger. Racking the slide back a few times, I tested the trigger. The difference was not dramatic--not that I expected it to be with the marching orders I gave Jim--but the front sight shimmy that I often experience when pulling the M&P trigger was gone. At the range, I definitely noticed that the smaller, modified grip helped me control recoil for faster follow-up shots. I also had a markedly easier time pulling the trigger back smoothly due to the shorter trigger reach. The benefit of the smoother action could not be discounted either. To get a true sense of how a gun feels, I prefer to do it by drawing from a holster. I used a Blade-Tech holster with SR belt loops for this article. I was impressed--the holster held the gun firmly and its cantable design gives great versatility. You may be inclined to think that the smaller grip would make the gun comfortable only for people with small hands, but that isn't the case. Several people with medium-size hands tried my modified .45 and preferred the custom grip shape. With this in mind, I would suggest that the grip modification would be worthwhile for shooters with either small- or medium-size hands. I ran a few hundred rounds through the gun and experienced no failures, and I think I'm going to like this gun as well as I like my M&P40--and so will you if you're looking for great ergonomics, adaptability and reliability in a .45 pistol. And thanks to Predator Custom Shop, it's a beauty to boot.